The following comments about attractions in Borobudur have been posted from individuals. We believe that the best reviews of Borobudur, Indonesia are written by travellers and holiday makers who have experienced Borobudur first hand and want to share their thoughts. Can you share yours? Please help us expand this section of our Borobudur World Guide. Let us know what you think about the attractions in Borobudur, Indonesia. Submit comments about Borobudur attractions here. Not a Buddhist building but you might also wish to try the Hindu temple that is just under 60kms away from the Borobudur ruins at Prombanan. 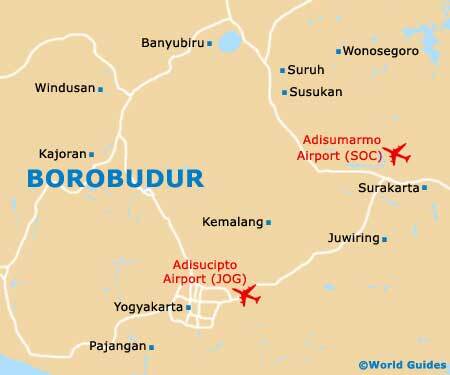 It isn't that much of a stretch from Yogyakarta Adisucipto International Airport too. I wasn't going to question why a country such as Indonesia, which is home to the world's biggest population of Muslims, had arguably the best Buddhist temple on the planet in Borobudur until I had got there. What I was told was true though and even those without the slightest interest in religion or religious buildings will be blown away by these historical ruins. Thoroughly enjoyed this attraction. Perhaps it should be mentioned that this part of the town is also pretty near to Mount Merapi. A little dangerous as it is among the country's most active volcanoes, but still fascinating. It's interesting to visit the ancient lake, which has now dried out but has been replaced by villages and orchards. There are great views of Borobudur from this area and the lush lotus flowers are worthy of a few spots in most photo albums. Not sure if we managed to get them all but a quest to take a picture next to every one of the Buddha statues around Borobudur was a riveting challenge as they are scattered all over Borobudur. Pretty amazing that they have been around hundreds, if not thousands, of years and they were among the best-crafted Buddha statues I have seen outside of countries such as Thailand.